Following on from the themes in Grounded, welcome to our Ceilidh! Fuaigh is being shown on Monday 10 October, 8.30pm at Tramway Arts Centre, 25 Albert Drive, Glasgow. Fuaigh is part of National Theatre of Scotland’s Home Away Festival, and is being shown alongside a week of performances from Chicago, New Delhi, Brisbane, Dundee, Tomintoul and Glenlivet, Glasgow, Jamaica, the World Wide Web and Rio de Janeiro. Our show is presented directly after a Corroboree devised by my colleague Fred Leone of Brisbane. Fred is from the Garawa and Butchella Nations of Queensland. The show is also presented in South Uist on Saturday 1 October and again in Barra on Sat 15 October as part of The Mod. In association with British Council and in partnership with Glasgow Life. With funding also from National Theatre Scotland, Creative Scotland, Bord na Gaidhlig, Traditional Arts Fund, Gaelic Books Council, and The Mod. What’s inside The Tardis? I have the key so come along and find out during Glasgow Merchant City Festival, 12noon to 4pm 30 July to 7 August. Follow the poem trail and arrows to find The Tardis and disappear into another world. Larach develops on the themes of Grounded, examining the influence of Gaels, who have moved from the homelands to the city, on the psyche of Glasgow. Meanwhile, Grounded is still touring with Flying Arts Alliance in Australia. Next stop Gympie Regional Gallery 23 August 2016 – 29 September 2016. The story of my time in jail in Alice Springs, subsequent lack of conviction in court, and implications of this story for the local Aboriginal population, can be linked to here. Then here for the court process following arrest. And a response to the Alice Springs jail post by Professor Smith can be found here. We are very excited that the Year 8 children of Ntaria school (Northern Territory, Australia) have joined in the Colour of Language arts educational project that came out of Grounded’s showing at An Lanntair in Stornoway, Scotland. The children have looked at Western Arrarnta trees, shrubs, flowers and earth and painted the colours that they saw and experienced, and added the Western Arrarnta words. 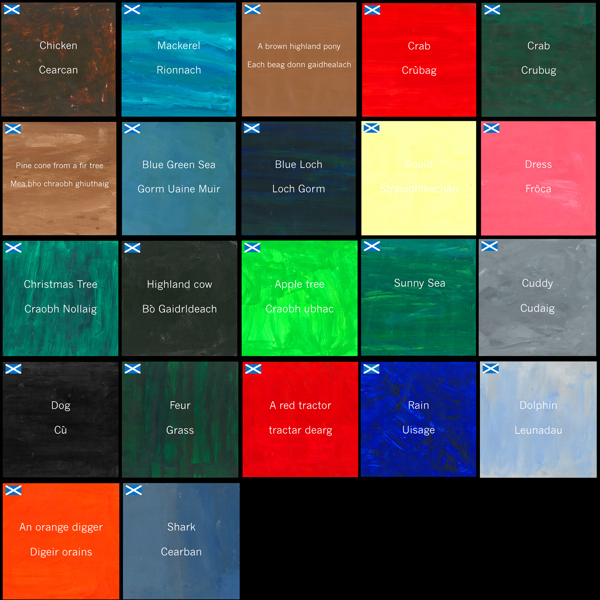 Their work will be exhibited alongside Leverhulme Memorial Gaelic School (Isle of Harris, Scotland) and Lional Gaelic School (Isle of Lewis, Scotland), and other schools that join in along the course of the project. I look forward to soon being able to post their work here. If you are connected to a Gaelic school or Australian Aboriginal school, and you are interested in joining, please do contact me via this blog. Thank you also to Greg who recorded the BBC Radio Scotland Voices of the Commonwealth interview we did in Glasgow during the Grounded exhibition at Festival 2014. The radio interview, which explores some of the concepts behind Grounded, is now available for listening to here. An interview about my work with journalist Jim Gilchrist is on the Struileag website which can be read at Jim Gilchrist’s review or linked to here. And a response to the Alice Springs jail post by Professor Smith can be found here. A review by Dr Kate Robinson can be found here. And you can listen to a cut down recording of “In Conversation: Connecting through Culture” at this Vimeo link. (16 mins.) (One of our afternoon events at Glasgow Festival 2014 showing). Or listen to some music from one of our Glasgow afternoon events here.